Triptych suggests a picture or painting. The building is situated in an arts environment, on a triangular footprint and embodying ecological sustainable design. Digital Showers is the name attributed to the artwork integrated into the Triptych Building, suggesting visual traces of the idea through metaphor and allegory. 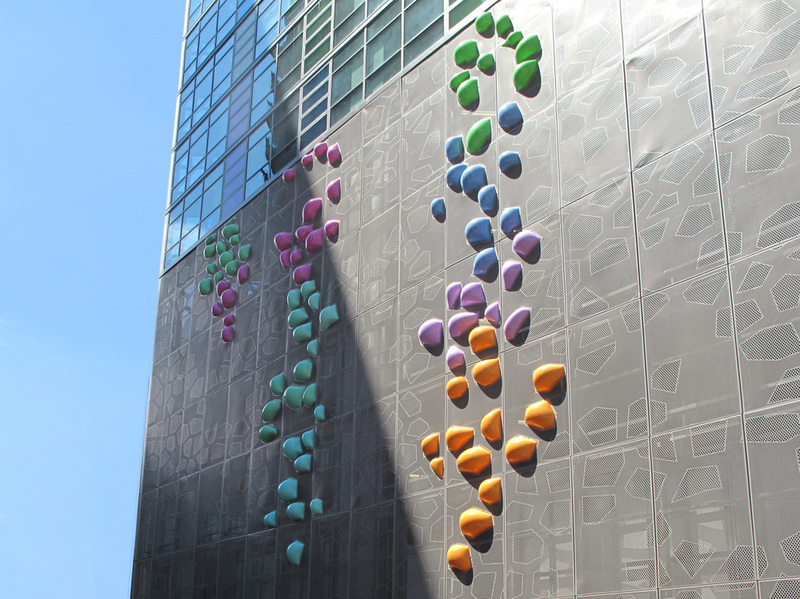 A summer shower is referenced with spectrum colour on all the windows that open and close on the East and North facade of the building. The rain runs down these windows and ‘soaks into the earth’ represented by the car park cladding. The cladding structure is derived from the pattern of cellulose; a porous carbohydrate forming the cell walls of all plants through which water and nutrients are transported. The pattern is scaled to different sizes for use in different contexts throughout the building. Triptych won the UDIA Environmental Excellence Award, 2011 and Best High Rise Development in Victoria.